linda lee studio: Weekend Countdown? Thank you to everyone who commented about the rejections... I'm trying not to be upset about it anymore. It just doesn't seem right to toss energy into something that's giving me nothing back. I'm sure that later this year I'll look back at this moment and realize that if the Etsy Dallas thing had panned out, I never would've been available for xyz opportunity. Yep. That's how I'm gonna think about it. There is always room for improvement. I know I need to spend more time getting better photos of my jewelry. I'm experimenting on sunny days and I think some of my more recent photos are much better-- but much of the jewelry on my Etsy site has poor photos. I recognize that. I also need to post items more regularly. I'm not sure whether that's something that worked against me or not when it came down to judgment time, but it may have. I know I need to get a brand... hell-- I'm still undecided about using linda lee studio as my "brand" ... I like it but I don't. I can't get the .com and that's annoying. All the good ones I can come up with are taken! The only thing that isn't taken is my name, because, well, I own that already. So I've been thinking about switching to using my name. *sigh* I am undecided there. I wish I could have someone run the business and logistics side of everything-- post my stuff to the internet, create my logo, maintain my website, mail stuff, etc... so I could just be free to create. This week is already proving to be challenging. There have been lots of those lately. We're nearing the end of a huge project at work, so everyone is putting in lots of hours. At the end of this week I'm pretty sure we're all going to collapse in a tired, aching heap of exhaustion. Maybe we'll have a few margaritas first. I should have a bit of a lull over the next couple of weeks. Lulls always make me incredibly nervous. I've had a "lull" turn into 8 weeks of no work... or even longer... and with the economy being the way it is, it's difficult to not worry about it. Isn't it gorgeous?? 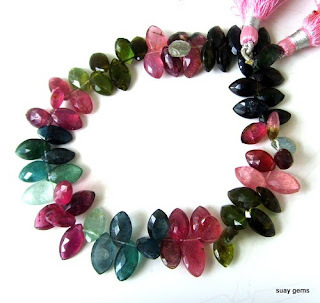 You just don't see blues like that often in tourmaline. I can't WAIT to play!! I already know that what I make is likely going to go into my own jewelry box. All my best pieces do, and these beads are calling for a spectacular design, indeed. So, I guess that's it for now. If you haven't already checked out my blog feature over at Macaroni & Glue, go check it out now! I'm glad you're here, reading. Thank you for taking the time out of your busy day, and don't be afraid to say hello! Love the quotes you shared. It is so difficult when these things happen. This last year I've spent so much time on things that have not served me. What I'm finding, though, is that this helps me focus my efforts. It's hard to explain - maybe I'll chat with ya on lj about it. I truly believe what Mr. Paush says about the brick wall. I've seen so many talented people quit because it's too hard. I'm convninced that the people who lead a "successful" (however you define that) creative life, are the ones who stick it out. Oh! It's not a necklace yet... that's just the strand of beads. Aren't they gorgeous?! Yes, true. I re-read these quotes last night, thinking about how I need to just keep going. Like Dori says... "Just keep swimming, just keep swimming, just keep swimming, swimming, swimming..."